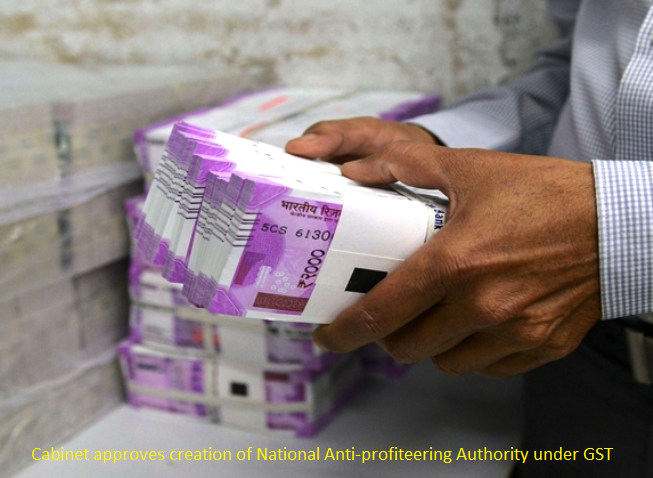 The Union Cabinet chaired by the Prime Minister Narendra Modi has given its approval for the creation of the posts of Chairman and Technical Members of the National Anti-profiteering Authority (NAA) under GST on November 16th. The setting up of the authority follows immediately on sharp reduction in the GST rates of a large number of items of mass consumption announced on November 14. This paves the way for the immediate establishment of this apex body, which is mandated to ensure that the benefits of the reduction in GST rates on goods or services are passed on to the ultimate consumers by way of a reduction in prices. It may be recalled that effective from midnight of 14th November, 2017 the GST rate has been slashed from 28 per cent to 18 per cent on goods falling under 178 headings. There are now only 50 items which attract the GST rate of 28 per cent. Likewise, a large number of items have witnessed a reduction in GST rates from 18 per cent to 12 per cent and so on and some goods have been completely exempt from GST. The "anti-profiteering" measures enshrined in the GST law provide an institutional mechanism to ensure that the full benefits of input tax credits and reduced GST rates on supply of goods or services flow to the consumers. This institutional framework comprises the NAA, a Standing Committee, Screening Committees in every State and the Directorate General of Safeguards in the Central Board of Excise & Customs (CBEC). Affected consumers who feel the benefit of commensurate reduction in prices is not being passed on when they purchase any goods or services may apply for relief to the Screening Committee in the particular State. However, in case the incident of profiteering relates to an item of mass impact with 'All India' ramification, the application may be directly made to the Standing Committee. After forming a prima facie view that there is an element of profiteering, the Standing Committee shall refer the matter for detailed investigation to the Director General of Safeguards, CBEC, which shall report its findings to the NAA.